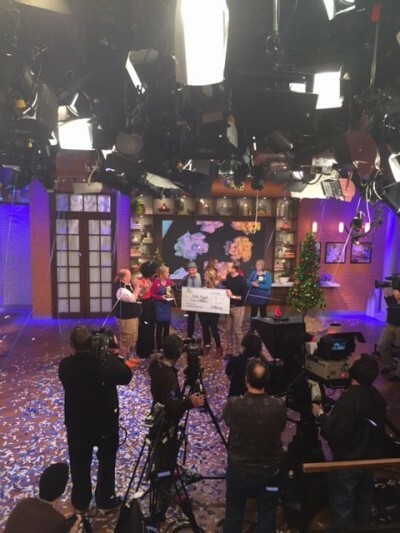 Beth Royals wins the $1,000,000 Pillsbury Bake-Off Contest! We are thrilled to announce another new addition to Pillsbury Royal-ty!!! 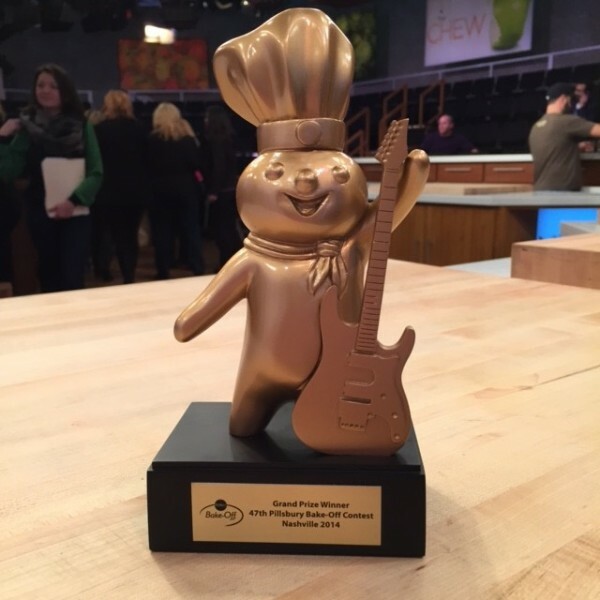 Cooking Contest Central member Beth Royals (also in our “Hall of Fame!”) was just announced on The Chew as the $1,000,000 Pillsbury Bake-Off contest grand prize winner!!! 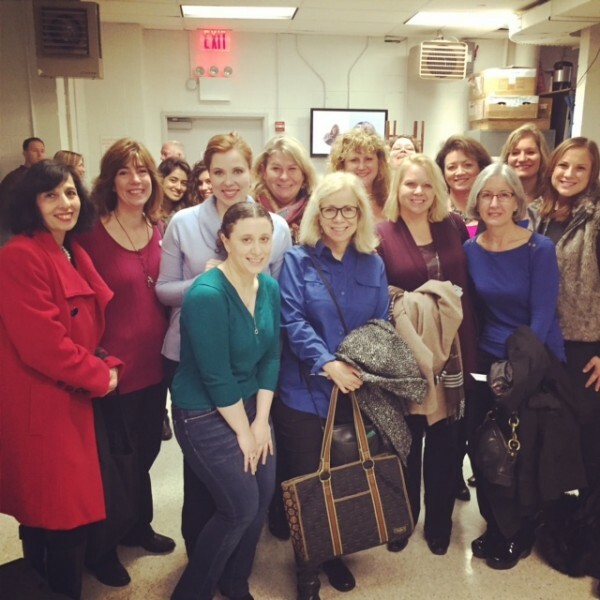 A huge group of fellow CCC members were there in the audience to cheer on Beth. What a thrill to watch her “Peanutty Pie Crust Clusters” win the biggest prize in the food world! My hands were shaking with such excitement, I could hardly snap a clear photo! Immediately after the big announcement, her entourage of supporters erupted in a standing ovation. 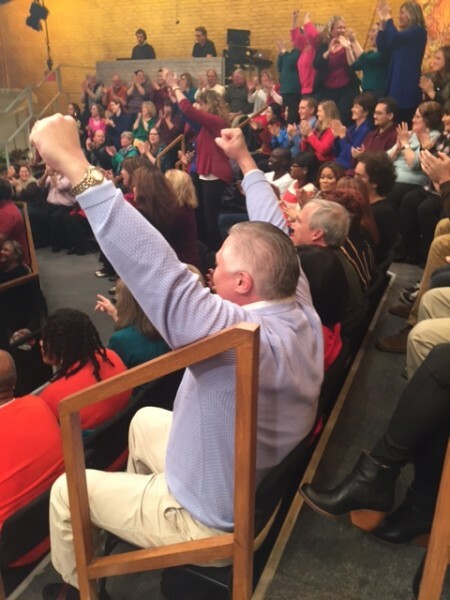 Beth’s husband thew his hands up in the air as their lives changed in the matter of a moment. 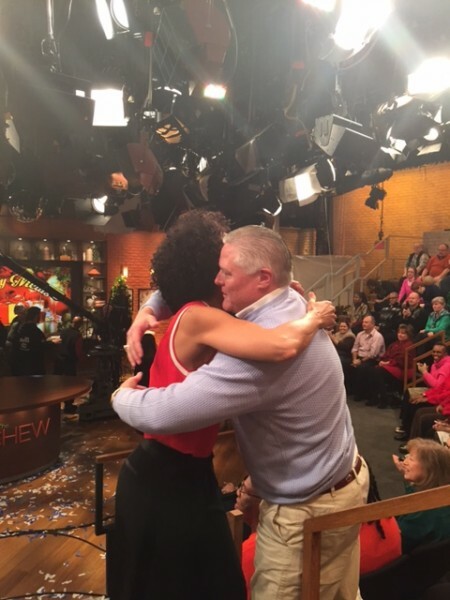 There wasn’t a dry eye in the house, including Carla Hall, who made a point of congratulating Beth’s husband. 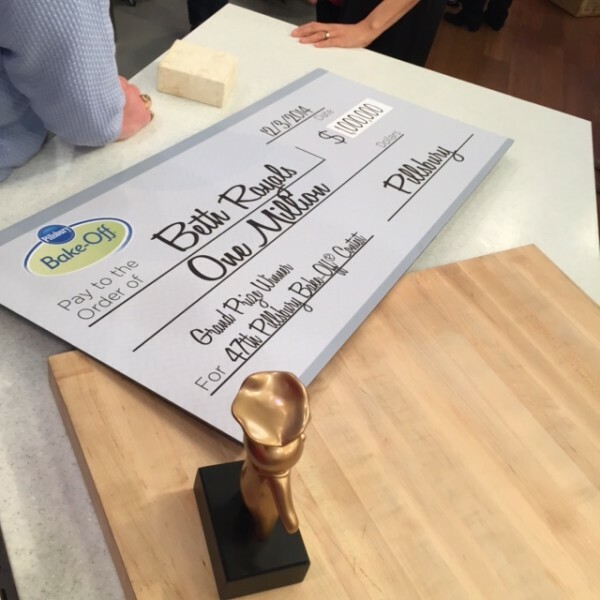 Carla interviewed Beth to find out a little more about her recipe and what she will do with the $1,000,000 prize. Beth said she will use the money to pay for her kids college educations and also plans on making some home improvements! We were able to stick around after the show and congratulate Beth in person. Look at that beautiful check! Don’t forget the ultimate Golden Doughboy! What an incredible day. How many times do you get to see your friend and fellow contester make culinary history? The power of watching someone’s entire world change because of their talents with food is simply unbelievable. We are so proud of you Beth!!! Congratulations, Beth!!!!!!!!!! Love all those familiar faces!!! Wonderful! I’d had all my fingers crossed …and (earlier) had pushed all relatives/friends to vote…………. couldn’t happen to a more wonderful person …. great to see John too! Beth, we are all so incredibly happy for you!! Of course, we knew all along that you would win! Congratulations Beth! So creative and well-deserved. Congratulations to Beth and her most proud taste tester and husband John. So glad she got to meet you! She has heard me talk about you for years. and of course has gotten to know you through other contesters and online posts. So very happy for Beth. I just knew she would win. I had the privilege of meeting her many years ago at a cookoff and a nicer gal you won’t find. Magical day for Beth and her family AND for our “family” here at CCC! A BIG congratulations to you, Beth! Congratulations Beth! That was pure genius with that recipe and enjoy your win! Time to Celebrate, and what better time then during the magic of Christmas days where dreams really do come true! This is way too exciting! GO BETH and CCC…CONGRATULATIONS!!! It couldn’t happen to a nice girl!!! Very happy for you, Beth! It was a very creative recipe and a well-deserved win! Congrats to Beth and the whole Royals family! So exciting and well deserved! I knew you would and so glad I helped too with voting for your amazing recipe. Congratulations Beth on your win! You did spectacular! Beth, we are all sooooo proud of you! Looking forward to trying your recipe. Beth, what a dream come true for you and your family! I can’t even imagine what a fun-filled holiday season you will have! 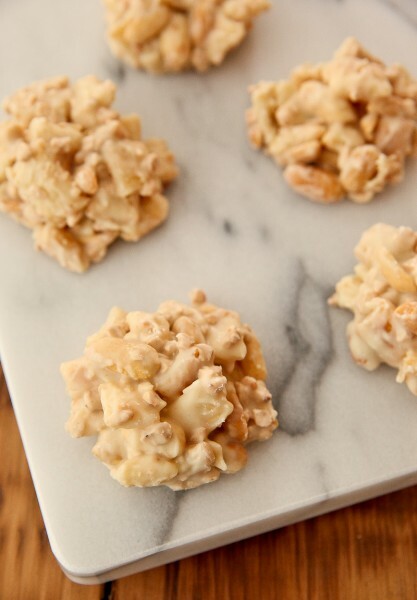 And the yummy Peanutty Pie Crust Clusters you will have to share! Congrats! Beth, a great recipe…so creative and so deserving. Congratulations on this amazing win! Sorry for the delayed response to this post. Looking back, the entire month of December seems like a blur. I can’t thank this group enough for your words of encouragement, votes, and messages of congratulations. So many of you have been an inspiration to me throughout my contesting years. This really is the most supportive, talented group of women and men I know. 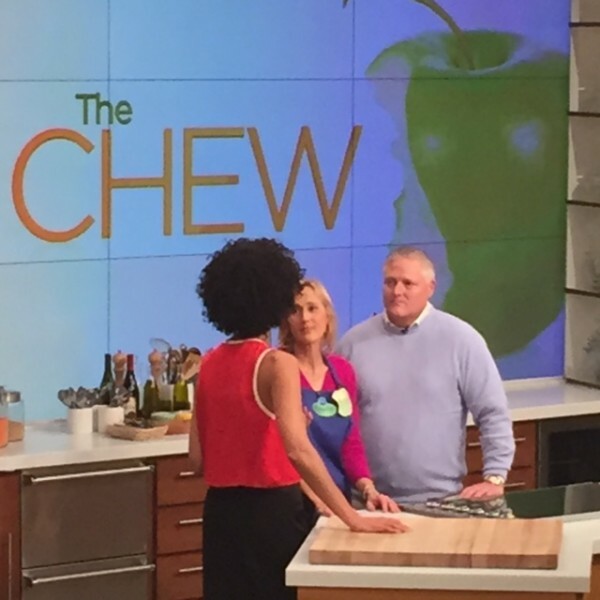 Thanks to all the CCC members who made the journey to NYC to be on the set of The Chew. Seeing your smiling faces in the audience meant more to me than you’ll ever know. Kristina, a big thank you for all you’ve done to better this site and to Susan for heading up and coordinating the PBO forums (and for being such an amazing cheerleader/support system at the Bake-Off).